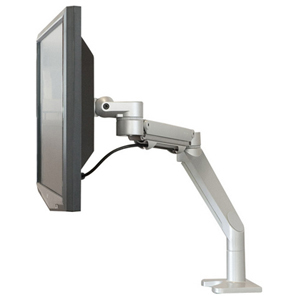 The Willow monitor mount features a streamlined design ideal for supporting lightweight monitors weighing 1-14 pounds. A high performance spring combined with the parallel linkage design keeps monitors perfectly balanced while providing easy vertical adjustment. Willow is available with a C-Clamp or Grommet mount and can be easily expanded to accommodate a second monitor with the addition of our Dual or Dual-Wide conversion kits, which can be purchased separately.
? Collapsible: Down to 4.25"